We purchased a house a few years back and did A LOT of remodeling! We pretty much did everything ourselves with the help of family and friends. I was finally able to compile some before and after photos. Deck photos will also be coming soon! Just to summarize what we did throughout the house: re-painted all the walls, ceiling, replaced flooring, baseboards, all interior doors, windows, hardware and lighting. Additional details of each space is below. Overall, I think what gave the whole house a lift was just a new paint job! We decided to just go with all white walls for the entire house. 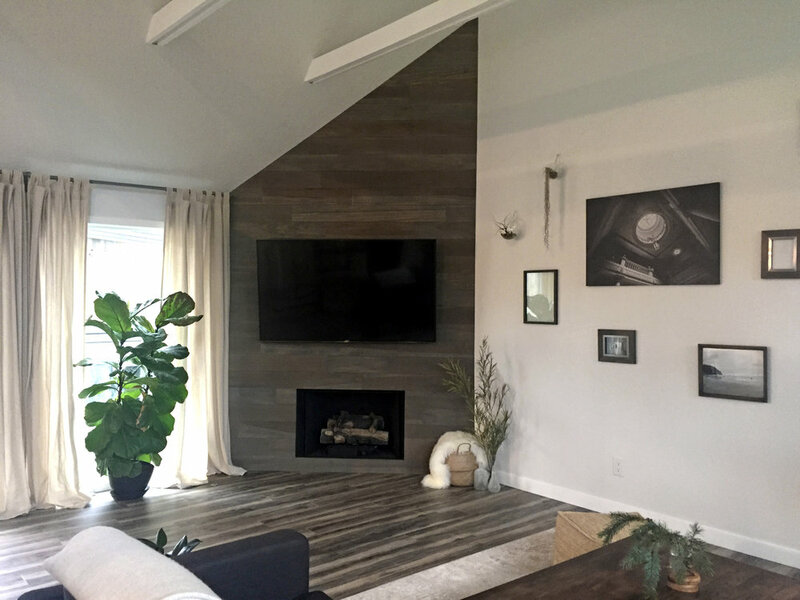 I wanted something fresh and neutral, with rustic and industrial touches, so I figured that I can always add color and rustic touches with my interior decor. Also, we can always re-paint later if we wanted to! Hope you enjoy the photos! Since images are cropped in previews below, you can click on each photo to enlarge and see more of the space. In the living area, we re-painted the metal spiral staircase (we had an outside vendor come out to spray-paint the metal, since we did not want to deal with the mess ourselves). 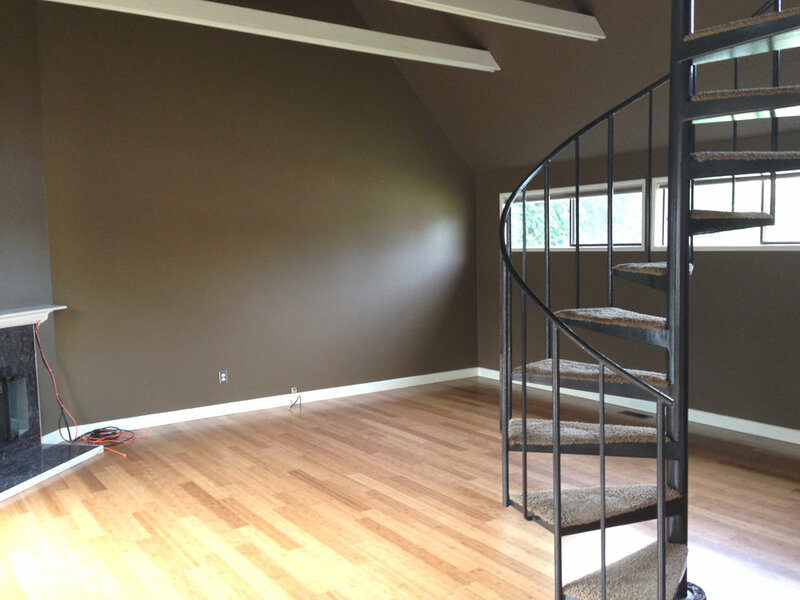 We removed carpet from the steps and installed poplar treads. We had to cut each wood piece individually (could not use a template) since each metal tread was a slightly different size! Then, we burned and stained the poplar treads to match the flooring in the house. We also tore out the old fireplace mantel and covered the wall with poplar slabs which again we burned and stained to match the flooring. We installed a storage shelf behind the TV for cables and other devices. Kitchen area was probably the most renovated! Not sure if you can see from the third kitchen "before" photo above, but there was a door that was going into a bedroom from the kitchen (to the left hand side of the stove, if you click on the photo to enlarge, you can see a small snippet of the doorway). 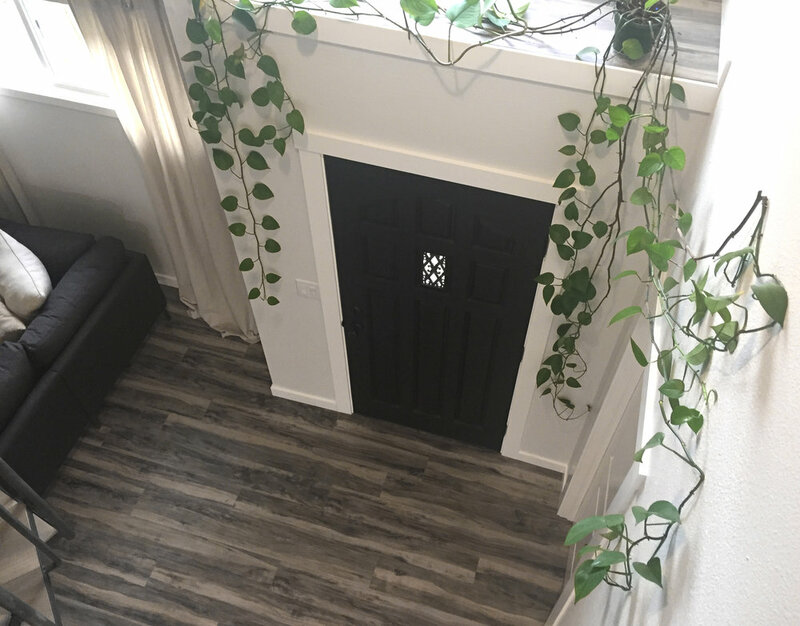 In order to expand the kitchen area a little bit, we closed off that door and made a door into the bedroom from the living room/entrance area. That took a lot of work, as you can imagine! By doing this, we were able to add more storage and extend our countertop island. 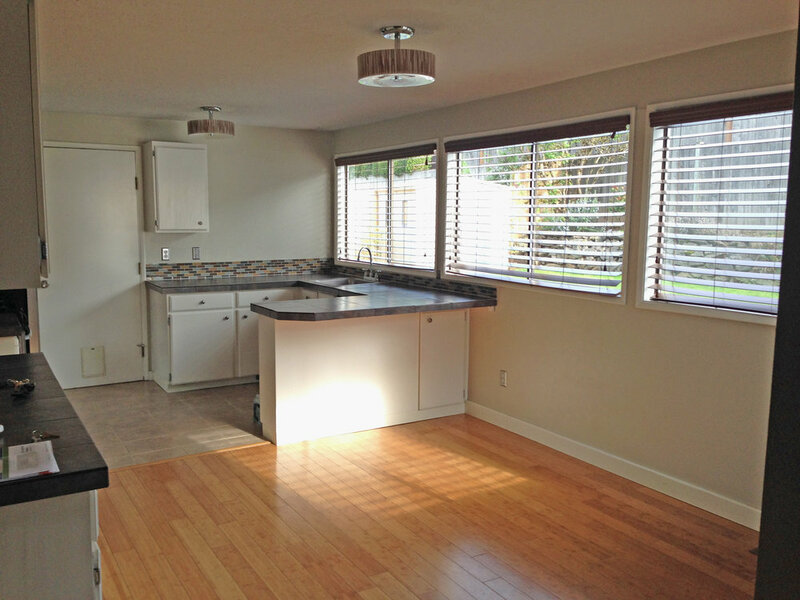 We also replaced all old cabinets/counters, backsplash and appliances with new ones. We installed fully custom open shelving on the wall adjacent to the window, in order to maximize storage and at the same time to keep the window exposed. Plus, I love the rustic touch they bring to an all white kitchen. The shelves are out of poplar and were burned and stained to match the shade of the floor. Our friend did a phenomenal job welding the metal shelf brackets for us! We had a vendor come out to install the countertop and sink, but everything else in the kitchen we did ourselves with awesome skills from our friends and family. Again, mostly everything was re-done in the bathrooms. First two photos are of the downstairs bathroom and third photo is the upstairs bathroom. 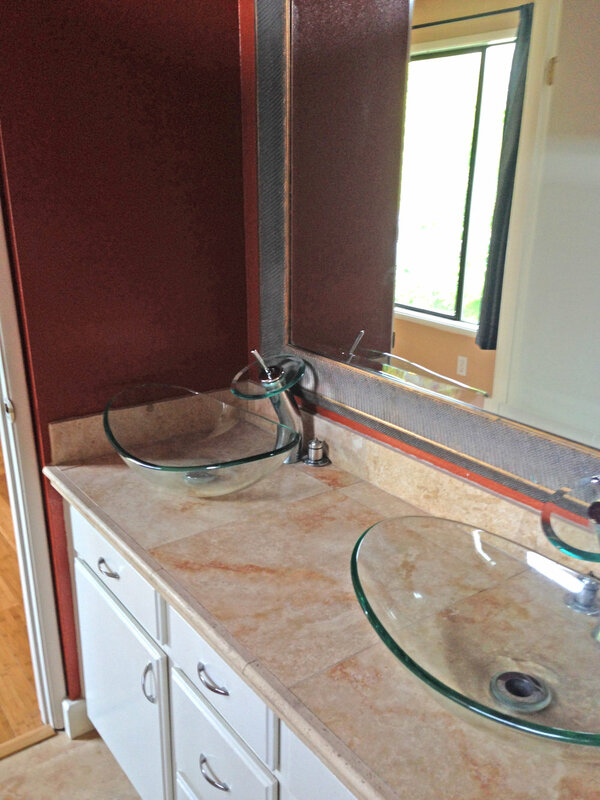 There were two sinks in the downstairs bathroom which we made into one and added extra storage instead. Both bathroom floors were re-done with new tile (same tile as you see in the third shower "after" photo above). The tub in the upstairs bathroom was converted into a shower. My father-in-law did a fantastic job with the tile work! He is so very detailed with all the work that he does, everything came out perfect, I just couldn't be happier with the results! There is also another room adjacent to the master bedroom that was painted turquoise, which we also re-painted white. I don't have any good images of that room at this point, since we are preparing it for a nursery ;) Baby due in May! Will post some photos of it later, once done! Hope you enjoyed these few snippets of our house. I hope to share some process photos of the spaces above, as well as exterior photos of our new deck with you soon!